January 19, 2016 by Theresa B. Clarke 2 comments on "JMU Marketing Students Help Local Non-Profit in the First College of Business MLK Day of Service"
Left to right: Natalie Krewin, Laura Hart, Claudia Schnorbus, Elka Feinstein, Amy Goffe, Maianh Phan, Patrick Shamburger, John Thompson, Jacob Shibley, and Drew Dyer. The moment Dr. Clarke presented our Digital Marketing Practicum class with the opportunity to participate in a day of community service by developing a cohesive marketing strategy for EMDM, our minds buzzed with anticipation. Our goal was aimed at increasing sales of our client’s birthday party events by utilizing and combining our marketing expertise. We spent a total of five hours each, yielding 100 hours of combined service, working towards an objective that will ultimately benefit the local Harrisonburg community. At the start of the day, Dr. Clarke divided us into cross-functional teams based on our team roles in the Google Online Marketing Challenge (GOMC): Brand Managers, Strategists, Analysts, Team Leaders, and Account Managers. The specialized roles allowed us to work with other students in the class, outside of our GOMC project, to manage individual tasks that contributed to our overall goal. Our teams were positioned in an open environment, which allowed for greater collaboration between all cross-functional groups. As the day went on, teams were able to develop multiple marketing strategies to present to the Explore More Discovery Museum. This is the first time we, the Google Online Marketing Challenge students, have participated in a service event all together. Needless to say, we were eager to spend our time serving the community and sharing our marketing skills. The Account Manager team consisted of Amy Goffe, Laura Hart, Claudia Schnorbus, Patrick Shamburger, and John Thompson. This group consulted with the EMDM Director, Lisa Schull mid-way through the day to ask questions and obtain information. In preparation for the client call, the account managers brainstormed a list of questions that were geared toward finding how we can better help EMDM’s event sales, specifically for birthday parties. The team was also in charge of taking the presentation template, designed by Brand Managers, and incorporating the class content to present to EMDM. Account Managers were an important component of our process, as their main objective was to understand everything about the EMDM’s current situation and then bring everything together in the end for the final the presentation to the client. The Analyst team was made up of Alex Adley, Jacob Brown, Anne Delafield, Caitlin Fikac, and Alex Murphy. Tasked with the job of creating an extensive competitive analysis for EMDM, this team went into great detail with regards to over 25 of EMDM’s competitors and their offerings. After developing and analyzing a spreadsheet full of competitive data, the team looked at trends among competitors, compared them to EMDM, and conveyed their findings to members of the Account Manager team through a perceptual map. Front row: Alexandra Ender and Emily Maynard. Back row: Lynn Radocha, Morgan Foran, and Matthew Deters. Amy Goffe and Cari Ross getting into the spirit of the event. The final team, Brand Managers, had a primary objective of publicizing the experience for the members of our class. This consisted of live tweeting and creating a guest post for Dr. Clarke’s blog to track and discuss the activities of all 25 students throughout the day of service. 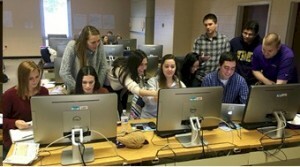 Brand Managers were in charge of taking pictures, inquiring and keeping up with the progress of the other teams, and collaborating with cross-functional groups. In addition, Brand Managers were assigned to design an aesthetically pleasing template for the final presentation to EMDM. By the end of the day, our class of 25 students alone devoted a total of 100 service hours to further benefit the Harrisonburg community. 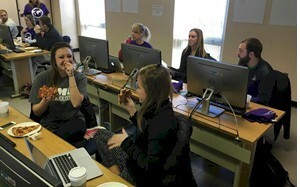 Our class was successfully able to develop a cohesive marketing plan for our client. The plan consisted of ways to enhance their current website, promote and advertise their birthday party experience, and create “add ons” to increase revenue. We had a great time working with EMDM and were happy to help them work towards their sales goal. 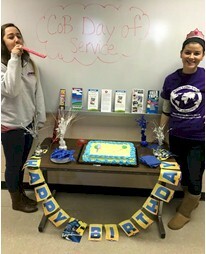 Overall the first College of Business MLK Day of Service was a great success, filled with pizza, cakes, laughs, and camraderie among everyone involved! 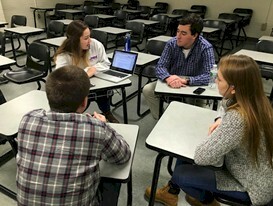 The JMU Google Online Marketing Challenge Class of 2016 participates in the first College of Business MLK Day of Service by developing marketing strategies for a local non-profit. 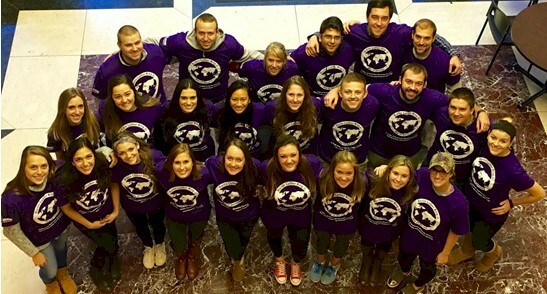 2 Comments on "JMU Marketing Students Help Local Non-Profit in the First College of Business MLK Day of Service"
Explore More Discovery Museum is so grateful to all of you for providing this thorough analysis. We now have some tangible strategies to improve our services and increase our revenue. Museum staff members are reviewing all of this information and we look forward to implementing many of your recommendations to make a big impact! Thanks again! Next Next post: Is Google AdWords Certification Important for Digital Marketing Students?